Most adults have pets as a part of their childhood memories. Unfortunately for me, each of my pets came with a traumatic experience. 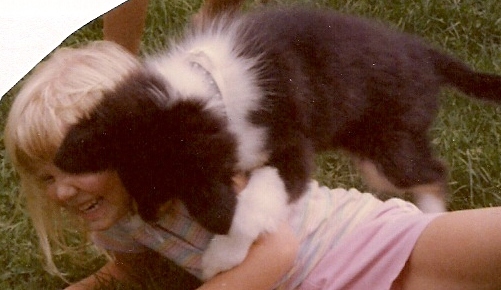 Our first dog, a collie named Dolly, was sent to a kennel while we went on a family vacation to Disney World. When we returned, my dad went to pick her up and came back claiming that she had run away from the kennel and was never found. At the age of 3, I was devastated. I still remember how hard I cried – burying my face in the couch as if the world had come to an end. I didn’t find out until I was in my 20s that Dolly had actually been put to sleep because she had bitten my sister. When it came up at dinner and this truth was revealed, my sister and father were both shocked that I had not figured that out by then. At the time, I thought to myself “How many other lies have I been told in my life that I have foolishly believed?” Apparently, I take other people’s statements at face value, which I’m learning isn’t always a good attribute. When I was older, approximately age 8, we had a toy poodle named Peaches. It was early in the morning on the day after Halloween and we were getting ready for school. My mom had let the dog outside to go to the bathroom and I heard her whining at the door. I let her inside and immediately realized that she was bleeding pretty severely. Turns out she had literally been bitten in half by a German Shepherd that lived in the home behind ours. She was rushed to the animal clinic where they barely saved her life. They had to remove a large portion of her intestines that had been damaged and suture her stomach back together, but she survived. She lived another 10 or 12 years after that, but those traumatic images of her bleeding profusely were forever lodged in my brain. Even seeing her with stitches after the fact was pretty traumatizing. Outside of this one incident, however, Peaches was the best dog I have ever had. She was present for all my growing up years and was the epitome of man’s best friend. Between Dollie and Peaches we had Penny for a short time, who definitely carries the worst pet-related story of my childhood. That’s her in the picture above and its the only one that I have of her. We got her as a six week old puppy and only had her for two weeks. We had been keeping her in the laundry room because she was still being potty trained. I was playing in the playroom in the dormer upstairs and heard my father screaming. This was not out of the ordinary so I continued to play. It was only later when the police had arrived that I realized what had happened. Apparently, Penny nipped at my father (as puppies sometimes do) and drew blood. This enraged him and her threw Penny out the back door so hard that her neck snapped when she hit the cement. She died instantly. Yes, that’s right. My father killed my pet when I was just 4 years old. I have two lasting memories from that night. The first is of the police cars parked outside my home on the street. With this image of the police cars – lights glowing brightly – I came to the realization that my father’s fits of rage were not normal. The second memory is an image that is strongly imprinted in my brain. Its a single drip of blood running down the side of our 70s green clothes dryer. At the time, I thought it was Penny’s blood but learned as I got older and the incident was discussed with my mother that the blood belonged to my father. It was from the bite Penny made that caused my father to become so angry. To this day, those colors – that green and blood red – when together cause an anxious reaction in me. It helps that today as an adult I understand that she did not suffer. The positive result of this incident was that my father was forced to enter a program for batterers. He successfully completed the program and even anonymously endorsed it in the local newspaper a few years later. He was quoted in that article stating that he realized when he killed Penny that he had a serious problem with his anger. And because of the treatment he received, things got better in my family for a long time after that – about six years actually. Its interesting that with all my pet related trauma, I ended up marrying a lover of animals, a man who works in the veterinary field. I am a news reporter suffering from Bell's Palsy.